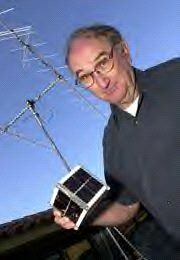 Stanford professor Robert Twiggs holds a model of the CubeSat design, with communications equipment in the background. Photo: L.A. Cicero/Stanford University. A Utah-based company is revolutionizing the satellite technology field by marketing a small picosatellite design invented by a Stanford University professor. The first batch of the cube-shaped satellites is scheduled for launch in November. One Stop Satellite Solutions (OSSS) touts the so-called CubeSat design by mentioning that people can now build and launch their own satellite for less than the cost of a sports utility vehicle. Indeed, each CubeSat can be built and launched for well under $50,000, depending on how the buyer wishes to outfit their new craft. "Just as Henry Ford made the automobile affordable to the masses for the first time in the early 20th Century, our CubeSat satellite will make space satellites affordable to the masses for the first time in the early 21st Century. With our CubeSat satellites, which measure only 4 x 4 x 4 inches, space has been opened to individuals and groups in the general public, academic institutions (large) and small as well as large businesses and corporations. These satellites will be launched on our Multi-Payload Adapter, which could be viewed as a 'mass transportation' vehicle to space," Dale Richards, President of OSSS, said at a news conference in November. OSSS engineers say they can help configure private ground stations and computer and power systems on CubeSats as needed. Each CubeSat will draw energy and electricity by using a combination of solar and battery power. Efficient solar cells cover the outer skin of the craft to help power the complex electronics inside the more advanced CubeSat kits. The spacecraft is cubic in shape with measurements of only 4 inches on each side. Weighing in at approximately two pounds, the design kit comes in three separate versions, each with its own specific capabilities. The basic, stripped down kit features no electrical or communications systems and is best suited for personal non-scientific missions. 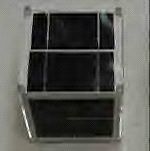 Next up the ladder is a design that contains electrical and computer systems, while another kit adds communications systems to this scheme. These kits can be best utilized for scientific applications. Model of a CubeSat. Photo: OSSS. No matter which type of CubeSat a customer may choose, it will contain around six trays that can hold almost any type of experiment -- from microgravity research, to satellite testing, to putting a name or personal momento into orbit. Robert Twiggs, a consulting professor at Stanford University and one of those involved in designing the CubeSat kits, hopes to sell that payload space for around $50,000. "We call that the TSFR space," said Twiggs, "and TSFR stands for This Space For Rent." "With this program, we are opening an unprecedented new door for opportunities in space that have previously been closed," Twiggs explained. "Now, based on inquiries we have received, I can envision some 100 to 200 of these small satellites being launched annually. However, to avoid littering space, we have plans to bring them back to earth once their programs have been completed." In fact, according to Michael Wood, an OSSS Program Manager, the story behind the conception of the idea of the CubeSat program stems from a phenomenon that gripped the nation -- and apparently the attention of Twiggs -- several years ago. "As a matter of fact, the CubeSat initially started out to imitate Beanie Baby boxes," Wood told Spaceflight Now in an interview. "(Twiggs's) idea is smaller is better," he explained. The deployment of the CubeSats will occur using the OSSS-developed Multi-Payload Adapter, or MPA. 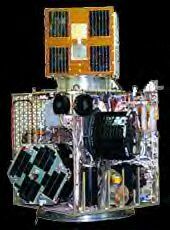 First flown aboard a Minotaur rocket mission in January 2000, the MPA can possibly accommodate up to a hundred CubeSats per mission in the future, Wood told Spaceflight Now. "That's our backbone apparatus," he said of the MPA. The first group of CubeSats is currently set to launch on November 15 aboard a Dnepr rocket from the Baikonur Cosmodrome in Kazakhstan. A Multi-Payload Adapter, similar to the one to be used on the CubeSat missions. Photo: OSSS. That launch will carry an expected maximum of 18 CubeSats from customers such as Stanford, California Polytechnic State University (Cal Poly), Montana State University, the University of Arizona, Dartmouth College, the University of Tokyo, and the Tokyo Institute of Technology. Inside the MPA for the November launch will be six poly-picosat orbiting deployers, or P-PODs, built by Cal Poly. Three CubeSat satellites will fit inside each P-POD for later deployment. Wood outlined some of the core challenges by noting the large number of groups involved in the CubeSat program. "Well, probably the challenges would be just coordination because there are so many involved," he told Spaceflight Now. Wood also said that using the Russians to launch CubeSats are a bit of a challenge because of difficulty in obtaining licenses and contracts. OSSS officials say they are planning another launch using a Dnepr rocket in November 2002. If you are interested in looking into purchasing a CubeSat kit, please see this web site for more information: http://www.osss.com/products/cubesatrfq.html.